One of the reasons for liking my day job: most of the time, we get to meet new interesting people and learn new things about the world we live in! :) That was definitely the case when I had the chance to meet and interview Machiko Maeyama, manga teacher and founder of the Machiko Manga School in Kemang, south Jakarta earlier this month. In all, the sensei was a delight to interview: her Indonesian was expressive (local slangs and all); she had answers for nearly everything; and -- perhaps the best part of all -- she delivered plenty of quotable remarks ie. words of wisdom to help put both fun and depth into an article (not to mention inspire the part-time mangaka in yours truly!). 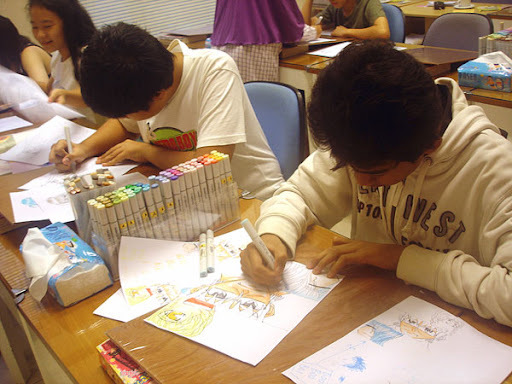 Part of a generation growing up on steady supplies of Japanese comic books, many young Indonesians today aspire to become professional manga artists for a living. Their challenge, as pointed out by manga teacher Machiko Maeyama, lies foremost in putting their hearts and minds into the profession. There’s something to be said about Japan’s impeccable pace for progress. Ever since Western ships docked its harbors in the latter half of 19th century, the remote island nation has catapulted at full throttle to becoming one of the world's largest economies and exporter of cultural products from cars to cuisine and comic books. The modern traditions of Japanese comic book (manga) and animation (anime) could be traced to as recently as 1940s post-war Japan, with Osamu Tezuka's Mighty Atom (Astro Boy) and Machiko Hasegawa’s Sazae-san leading the pack as pioneer works influencing all genres and styles to come. Far from being mere fantasies of beautiful characters with large eyes and long legs, manga has today gained a cult status taking a whole global generation’s lifestyles and aspirations by storm. 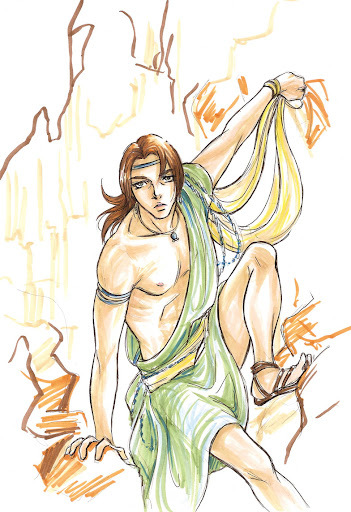 “A decade or so ago, [the comic markets of] US and Europe were a lot more skeptical of the Japanese manga style - perhaps due to its [stereotypically] lanky male character design. 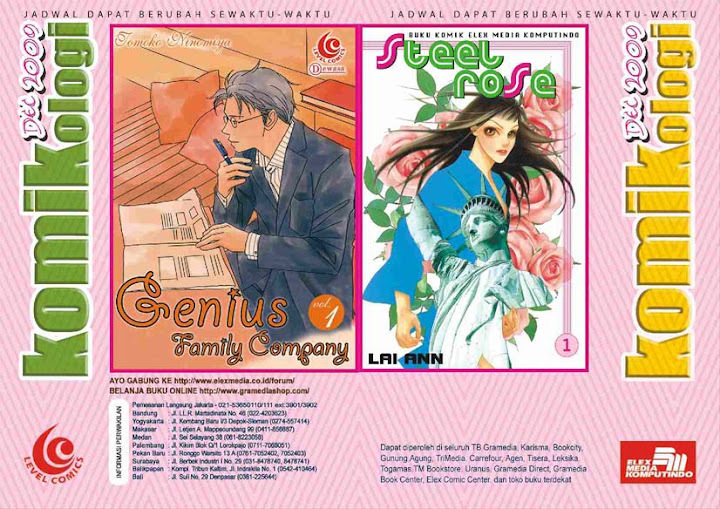 Now they see it as a fresh alternative to the macho superhero genre,” said Machiko Maeyama, manga artist and founder of the Machiko Manga School in Kemang, south Jakarta. Machiko-sensei, as she is normally addressed by students, migrated to Indonesia with her Japanese journalist husband in 1996. 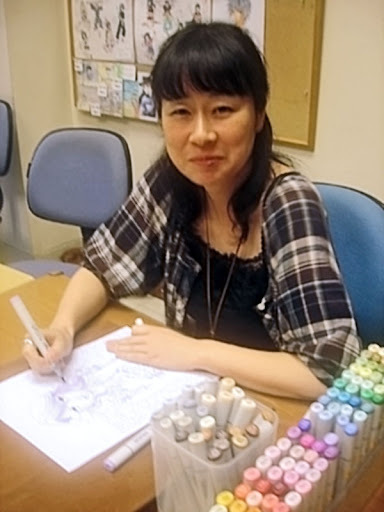 Her manga school first opened doors in 2002 after seeing the public’s enthusiastic response when she was leading a series of manga seminars and workshops with the Japan Foundation. 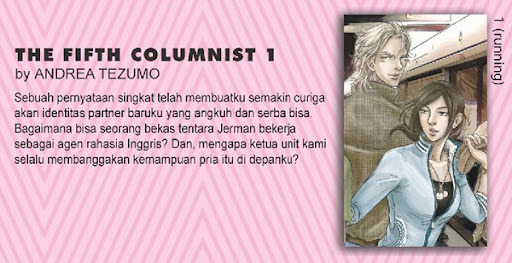 She has witnessed first-hand the development of “manga mania” in Indonesia over the years. 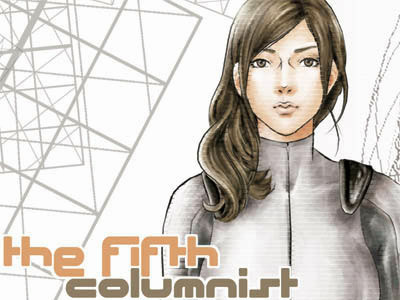 Her three published manga volumes to date had even been worked on while living in the country, with all editorial assistance and brainstorming done via telephone, fax or (later) emails. “Technology has made work more convenient nowadays. Back in the New Order era, I’ve had to go to a telecommunication kiosk (wartel) to fax my editor in Japan,” she reminisced. 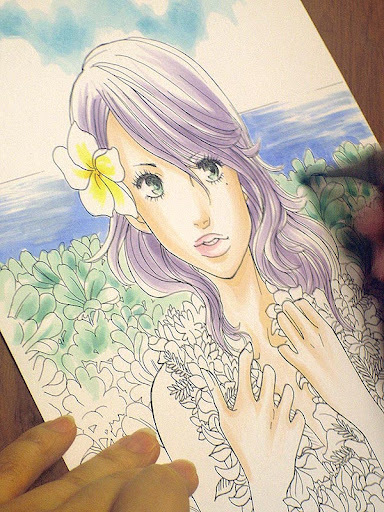 Of all the students she has taught, many have finished the course and are now treading the path of the professional manga artist. Machiko mentioned a particularly capable Dr. Vivian, a woman in her 30s who had been working as a plastic surgeon in Ireland before moving back to Indonesia. Aside from Vivian, who is now assistant to a famous professional Japanese mangaka and looking to release her debut comic in Japan, Machiko’s other students have also been published either locally or in the US. 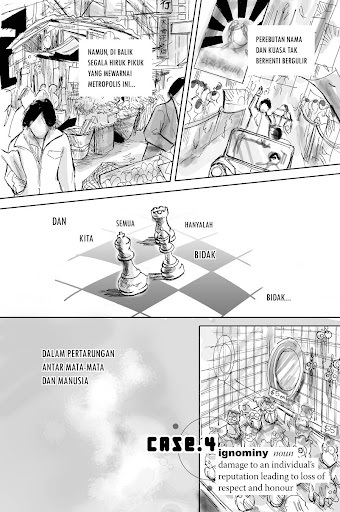 The latter proves a popular market for Indonesian artists to break into, thanks to its wide readership network and relative acceptance of works sporting liberal themes such as homosexuality and fetishes. 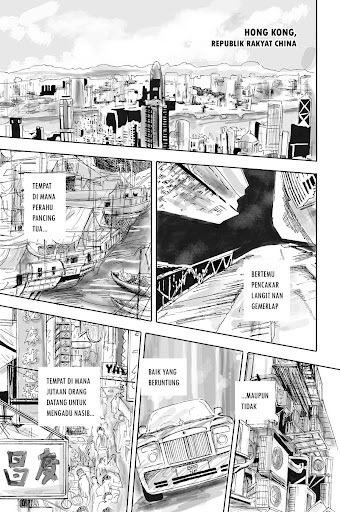 When speaking about the quality of Indonesia’s home-grown manga artists, Machiko reckoned the current generation has succeeded in bringing forth originality in their works. Nevertheless, she found it regrettable that many have not been able to pursue their manga career professionally. “As a professional, you're not just producing manga for yourself. You’d need to consider the market,” she said, adding that Japanese mangaka have come to understand this “make or break” motto very well. Japan’s popular manga market represents a fast changing mix of trends and demographics, requiring artists to contribute pages to “comic magazines” published at intervals before they could compile all published chapters in a full manga volume or tankobon. One of the current hit manga comic series in Japan, Bakuman, details the story of two teenagers trying to make a manga debut while still in school. Readers receive a questionnaire postcard at the end of each issue with a rating system, which puts readers in direct control of deciding which artists should or should not feature in the next issue. Putting aside the issue of tough competition among artists, other problems have rapidly risen in the wake of advanced computing and imbalance of manga supply and demand leading to piracy and unauthorized distribution. All over the Internet today, scanlation (scanned translation) groups are offering free or paid comic reading that have been scanned, translated and edited by and for members. Historically, it was considered “safe” to scanlate series that had not been commercially released in the country of distribution, but there have been some mixed views from publishers and copyright holders alike. As Machiko pointed out, Japanese publishers have also begun taking action to hold their share of the market. One way is to directly sell comics in digital format (to ease distribution) while planting anti-piracy features on the product. Doujinshi are self-published works created by amateurs and professionals that can be broadly divided into original works or aniparo (parody of existing anime and manga series). By publishing outside the regular industry, artists retain full rights to sales as well as other profits. Machiko said: “In the past, the usual route for a manga series was to appear firstly in comic magazines, compiled into a full volume, then made into an animation or live-action movie if it popular. The process is much variable now. She considered this the way forward as projects involving teams would most likely yield more effective results than those created single-handedly. She also believed comic books still had their own merit despite advances in digital media or 3D animation, thanks to their ability to bring stories and characters to life while still leaving room for readers’ imagination. Machiko-sensei, a fangirl?? 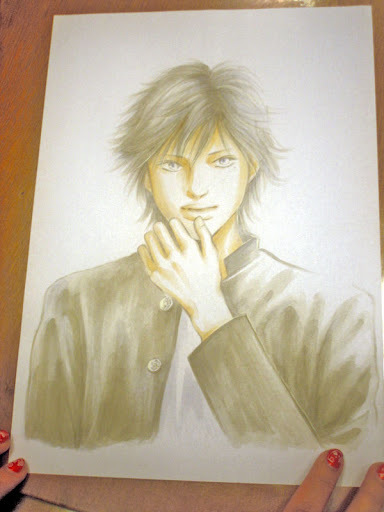 This, apparently, is her Copic rendition of darling hearthrob Kouji Seto. After a brief visit to Machiko Manga School in Kemang for work last week, I realised nothing was ever too late to begin exploring new manga techniques -- even if it meant spending hard-earned money on seemingly frivolous art materials! 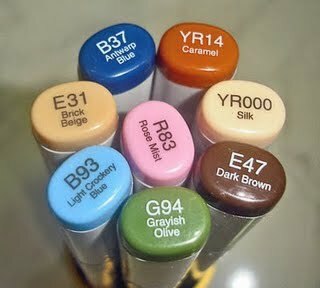 As much as I find Copic's waterproof quality convenient, the fact also means you cannot effectively blend colours unless using the brand's Colourless Blender, which is yet another marker to buy! Minus point(s): Could do with some background and more precise hand positioning/angling. Also, his head looks a little large? A simple statement was all it took to be doubtful of my new alpha-agent of a partner. How did a former German army recruit end up as a British spy? More importantly, why couldn't our unit chief stop bragging about how good this man was? Being a full-time writer/journalist whose life revolves around words (or struggling over lack thereof! ), I consider myself the exact opposite of a sales/marketing guru. Unfortunately, this does not grant me immunity from the golden 'curse' of Marketing Mix, which basically states that in order for a product to succeed in the market, you'd need to address the four issues of Product, Pricing, Placement and Promotion effectively. Out of the four Ps above, Product is visibly the only element that a typical manga artist has control of. Pricing and Placement, on the other hand, can get a bit tricky since they are largely owed to each publisher's discernments -- though you can always try lobbying!